Kurobuta happens to be located really close to home and upon our very first visit, during their opening week, we experienced probably the longest dinner of our lives. We had booked our table for around 8pm and by the time we had received just our starters, it happened to be 10pm. Considering this was before we were married and I had a curfew of 11pm to meet, BW made the decision to abandon our meal, grab something quick from Colbeh, and drop me home at the speed of light before my parents started bombarding us with phone-calls. 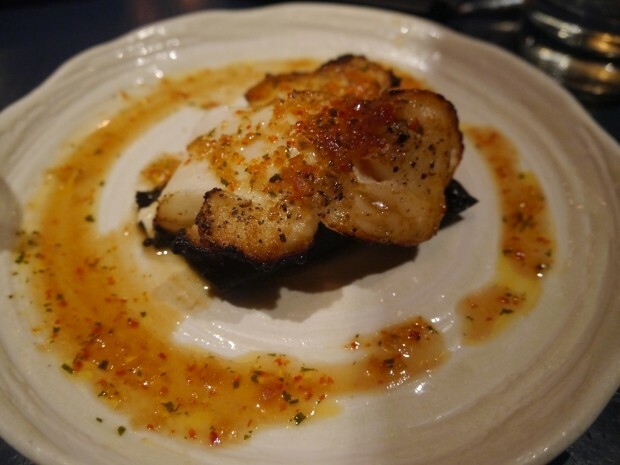 Although the two dishes, the yellowtail sashimi and sweet potato fries, were really good, we decided to overlook Kurobuta when choosing restaurants to dine at. That is up until a few months ago where we decided to give them a second chance and have been going back any chance we get! Seeing as BW’s Japanese-food loving uncle was in town for a few nights, it only made sense to take him there. Until this occasion, BW and I had been pretty useless and always forgot to pre order the halal items on the menu (in which they need 72 hour notification), so ended up eating only the veg and fish options (which are still good by the way!). This time round we happened to stop by after having breakfast in the neigbourhood and decided to try our luck – our dinner was two nights away! 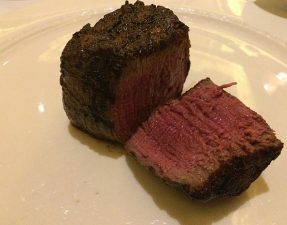 Very luckily, the chef informed us that another party had pre-ordered halal for the same evening and there would be just about enough in stock for our dinner too. Delicious and crunchy sweet potato fries that had been dipped in a batter and fried to perfection so that the sweet potato was still soft on the inside yet a slight crunchy exterior. The accompanying dipping sauces really added a new tasty dimension to these sweet fries with the bright green jalapeno sauce that gave a spicy kick and the kimchi mayo that added a tangy twist. 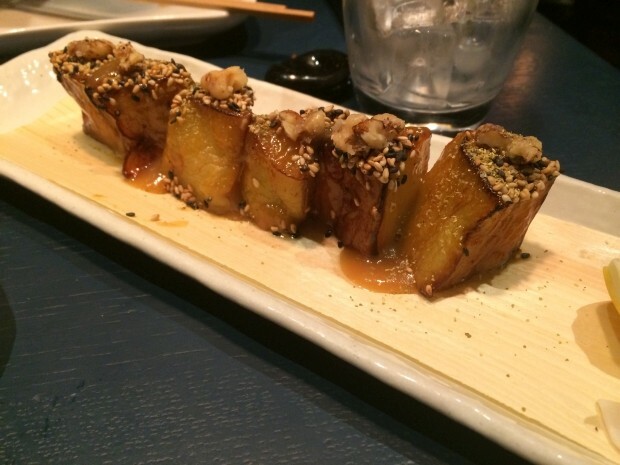 These were so addictive that we ended up ordering a second portion. 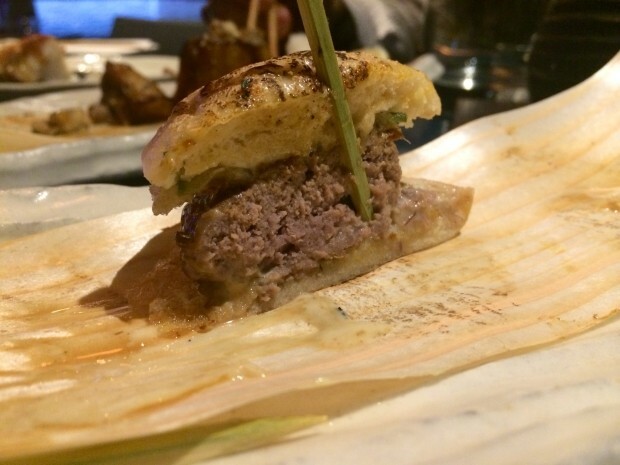 Unfortunately they weren’t able to source wagyu for the burgers (but still charged us £19 for two of them!) 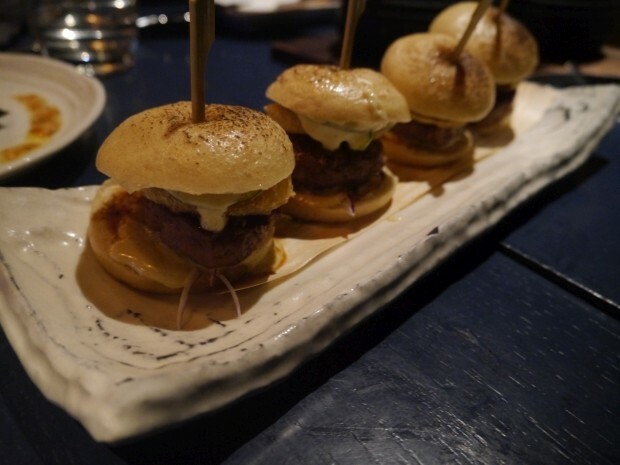 and the sliders were cooked to a well done, but believe me, it didn’t make a difference with a burger this small. 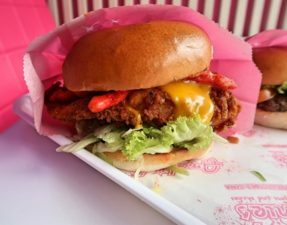 When you took a bite, you were greeted with so many different flavour combinations and textures from the crunchy onion ring to the tangy pickled cucumber and the creaminess from the umami mayo to juiciness from the burger patties – I could have eaten about five of these in one sitting. The beef was well flavoured and complimented all the other additions so well that we found it difficult to let go after just one burger. Next to arrive to the table were two fat lamb chops that were hot off the robata grill and drizzled in a spicy korean sauce. The chop was cooked so well that with each and every bite you got that juicy, pink meat and a tiny throat tickle from the spicy sauce. My mantra in life is that the best tasting lamb is one that is cooked with a good layer of mouth-melting fat attached and this is what Kurobuta did. In fact I enjoyed the fat so much, I ate BW’s share of fat (he doesn’t like fat so moooore for me!!) and his uncle even gave me his share too (yum!). Even though stated in the description, I didn’t get the nasu (aubergine) flavour from the dish. The baby chicken had been slightly blackened by the hot grill giving a nice smokiness to the tangy lemony, garlic sauce, and was really tender and moist. The sauce wasn’t overpowering at all and added a nice subtle zing to the chicken. 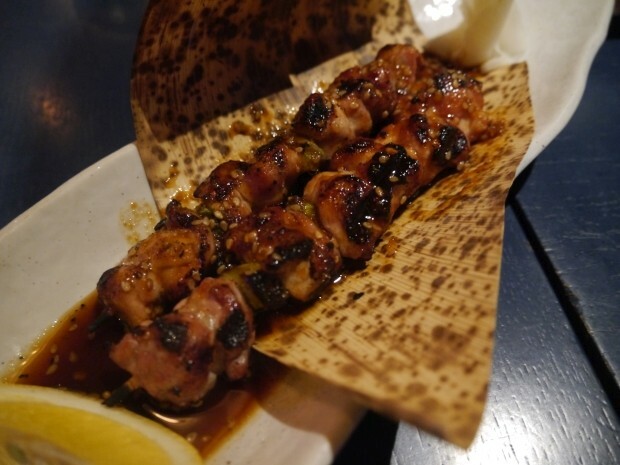 Two long skewers of soft, succulent boneless chicken pieces that had been smooshed together onto a stick and grilled to a nice char. A bbq sauce mixed with nutty sesame seeds had then been brushed on top of the skewers whilst hot to give a nice, sweet finish. This is one of my ultimate favourite dishes at Kurobuta and a repeat order every time. Incredibly soft aubergine chunks that have been covered in a sweet, sticky miso sauce and topped with crunchy, candied walnuts. The dish is served super piping hot but even when its cooled down a bit, the aubergine still manages to melt in your mouth – love it ! Two small pieces of white flaky sea bass arrived that had been delicately roasted so that the exterior had a subtle crisp but at £18, I expected a lot more from the flavour and even the size of the dish. The fish tasted good but I had expected more of a punch especially from the kombu (seaweed) and the spicy ponzu. 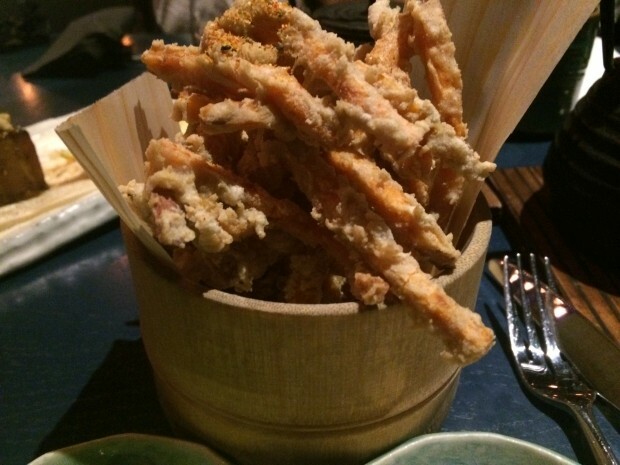 These not so baby shrimp had been dipped in tempura batter and fried to crispy, non-greasy perfection. 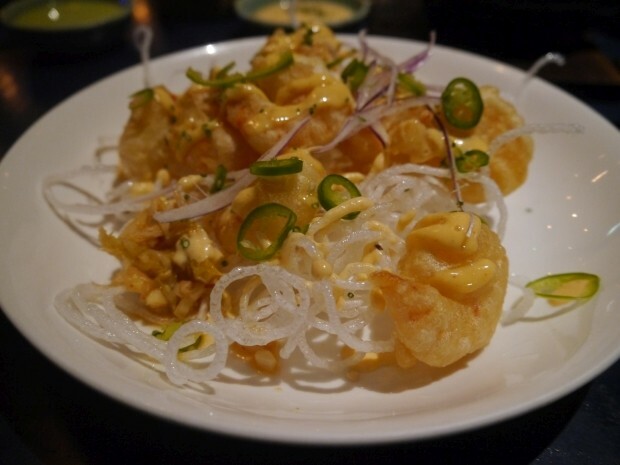 They lay on a bed of crunchy, fried rice noodles and scattered with chillies and a pink kimchi mayo. I think this had to be the only dish I wasn’t a fan of at Kurobuta. I found the salmon to be quite fishy and this didn’t make a great combination with the creamy bearnaise sauce. The “fries” was actually a small potato shard fried and placed on top. 6 uramakis (so the rice is on the outside) stuffed with raw tuna that had been mixed with chilli powder and then topped with bright red chilli sauce. 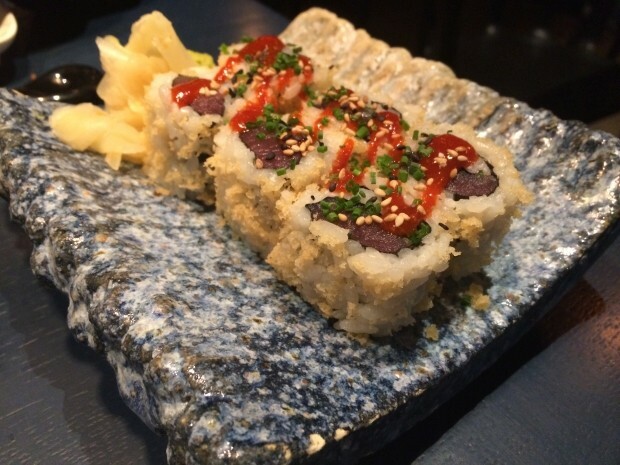 The makis had then been rolled around in tempura crunchies so there was a little crisp in each mouthful. The dish on the whole could have been a little more spicier but the tuna that had been used was fresh and delectable. Another typical order for me. 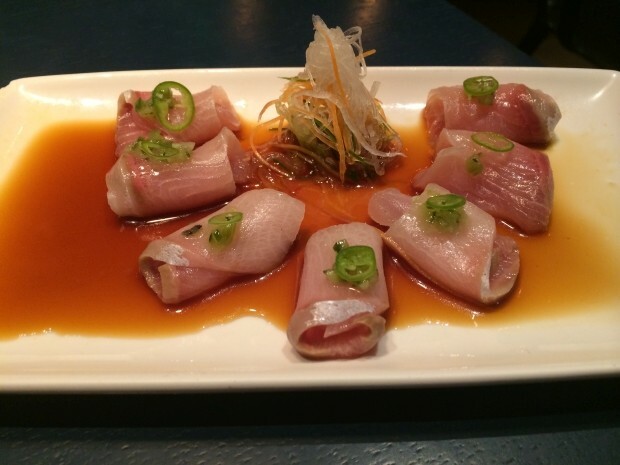 The meaty yellowtail comes fresh, lying on a pool of soy sauce, and topped with a green chilli wasabi salsa. The wasabi salsa doesn’t take over any of the other flavours and is only a subtle component of the dish. 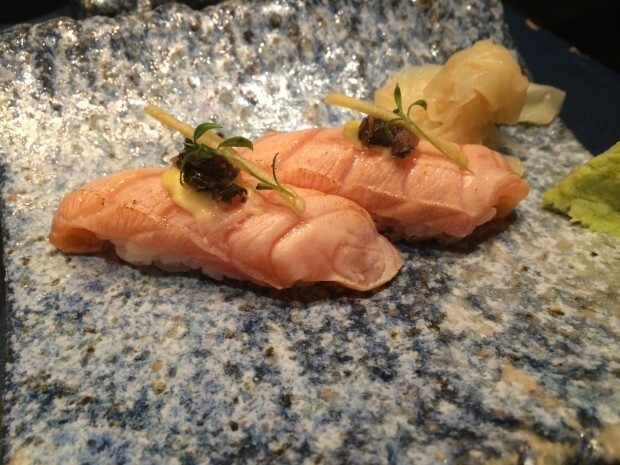 The yellow tail is of great quality and makes a refreshing change to the meal. 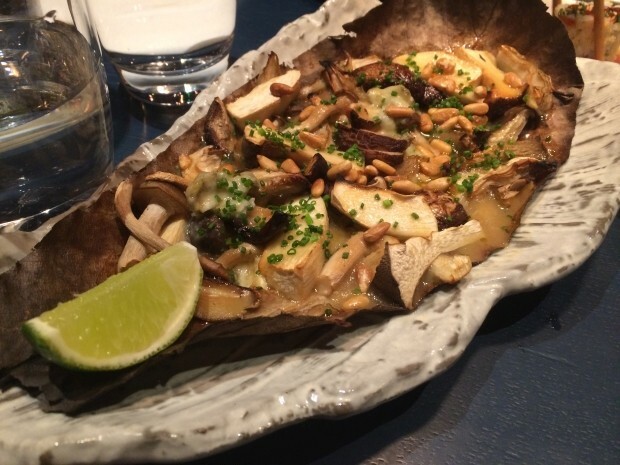 A big leaf arrives with an array of different mushrooms that have been mixed with warm, gooey gorgonzola cheese and crunchy pine nuts. After a couple of bites you are hit with the strong cheesiness from the gorgonzola which overtakes the mushroom’s earthiness and the nutty pine nuts. It wasn’t my favourite out of the bunch, as it became rich quite quickly, but definitely a good recommendation if you happen to be a big blue cheese fan or sharing with a group. I saw this on the dessert menu and could not help myself – a green tea mr whippy!! A super generous helping of green tea ice cream arrived to the table with crushed pistachio powder on the top and one spoon; this wasn’t made for sharing. The matcha adds a very subtle bitter tea taste but otherwise the vanilla really comes through and the pistachios adds a nutty element to the ice cream. As you can see from the above prices, Kurobuta isn’t exactly the cheapest affair and is probably on par with Novikov as far as pricing goes! But, for food that tastes this great and has the same consistency of good quality food each time I visit, I’m not surprised that Kurobuta can get away with their prices. This is probably the perfect restaurant if you’re in the mood to splurge on your partner for dinner, or even just for a nice birthday meal with a close group of friends. 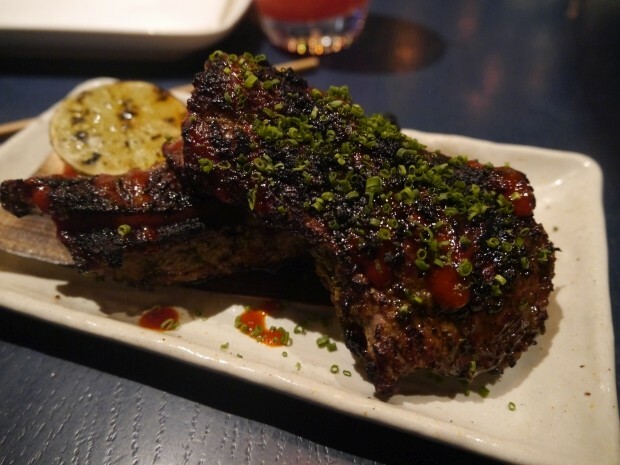 Just a tip though for when you decide to visit, Kurobuta’s dishes are made for sharing so keep this in mind for when you go so you don’t overorder. 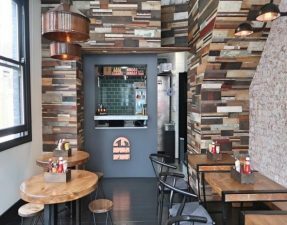 Typically when we’ve visited, the atmosphere tends to be that of a generally relaxed environment with dates and small groups of friends, however when we visited last (a Wednesday evening), the place was jam packed with work friends looking for a quick snack/drink after work. The music had also been cranked up so we ended up shouting to each other to communicate. The service this time round was really helpful especially in assisting us with the halal meat that was available and took care of us. 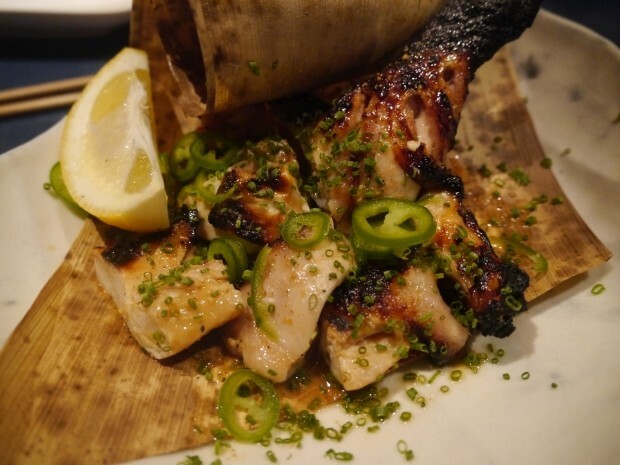 It really does make a refreshing change to the London halal food scene to be given the opportunity to dine at restaurants like Kurobuta, who offer a whole different dining experience to the traditional Japanese food. Im sure we’ll be back pretty soon. Free after 6:30pm or pay and display. Oh no, will update – thanks for letting me know!